A. N. C. Ladines, T. Hammerschmidt, R. Drautz. Formation energy of topologically close-packed phases and bcc/fcc/hcp solid solutions in the Fe-Nb system. The overall convex hull indicates the stability of the Fe2Nb Laves phases and the Fe7Nb6 mu-phase that are also observed experimentally. Precipitates of topologically close-packed (TCP) phases play an important role in hardening mechanisms of high-performance steels. 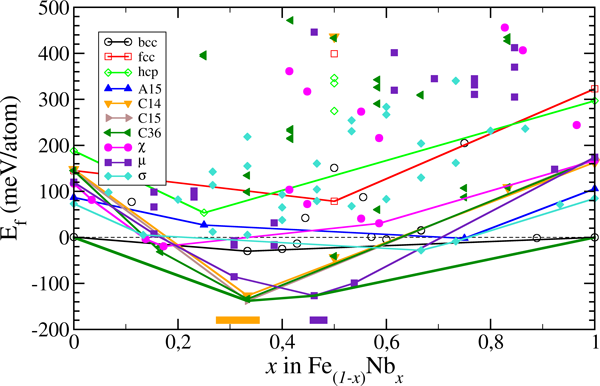 We analyze the influence of atomic size, electron count, magnetism and external stress on TCP phase stability in Fe-based binary transition metal alloys. Our density-functional theory calculations of structural stability are complemented by an analysis with an empirical structure map for TCP phases. The structural stability and lattice parameters of the Fe–Nb/Mo/V compounds are in good agreement with experiment. The average magnetic moments follow the Slater-Pauling relation to the average number of valence-electrons and can be rationalized in terms of the electronic density of states. The stabilizing effect of the magnetic energy, estimated by additional non-magnetic calculations, increases as the magnetic moment increases with band filling for the binary systems of Fe and early transition metals. For the case of Fe$_2$Nb, we demonstrate that the influence of magnetism and external stress is sufficiently large to alter the energetic ordering of the closely competing Laves phases C14, C15 and C36. We find that the A15 phase is not stabilized by atomic-size differences, while the stability of C14 is increasing with increasing difference in atomic size.